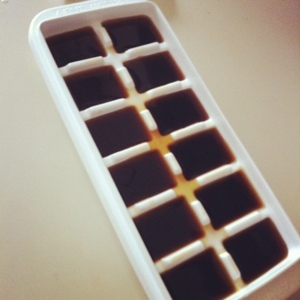 For some reason I decided to make a batch of coffee ice cubes–yup, I filled an ice cube tray with some leftover brewed coffee. It should work to make some nice undiluted iced coffee if there is power and, worst comes to worst, they’ll just melt right back into regular old coffee. This entry was posted in Current Affairs, meatless monday and tagged Coffee Ice Cubes, Hurricane Sandy, meatless monday, Power outages by jessica. Bookmark the permalink.